August | 2018 | mark Joseph "young"
This is mark Joseph “young” blog entry #265, on the subject of Versers in Motion. #257: Verser Relationships (covering chapters 85 through 105). I needed to do something with Slade, so I brought him to a white camp. The idea of having him suggest he thought he had returned to Vargas’ camp developed as I wrote, but I still don’t know where this section will take me. I had not intended a confrontation between Derek and Williams, but it seemed that my timeframe was going to require it, so I thought I should make it dramatic. I expect Williams to order Derek arrested, but Derek will act preemptively. Kondor now has Zeke with him, which I had not previously envisioned. I’m setting up the terms of their relationship and the character of the new associate as I go. I was still to some degree struggling with the Slade story, and now I had committed myself to a quick end with Kondor so I had to start thinking seriously about how to get them into that last world without a repeat of the random death bit. I didn’t yet have it. I stumbled into the new moral issue mostly from looking for some interesting dialogue, but once I saw it I spent a couple days trying to get it right. I had worked out most of this while writing the intervening chapters, trying to figure out what would most likely happen. I knew when I finished the previous Brown chapter that his “pre-emptive” action would have to be telling the security officers to arrest Williams before Williams said to arrest him, and that was the timing issue. Somewhere in my mind I realized that this would disrupt the room, as everyone was distracted by the unfolding drama at the security window, but I decided that this was something Derek would ignore and thus could be omitted from the narrative at this point. I didn’t need Zeke to accept the situation fully, but simply to accept that for the moment he did not have a better explanation, and that the present task was to survive. I don’t know whether Kondor has the equipment for a solar water collector. He has a camp shovel, but he needs a plastic sheet and a pot. I have been working on character sheets for my characters, so I’ll have to go through his equipment list. The usual plastic sheet is a ground cloth, but he has a tent with a floor so he might not have one. On the other hand, he might have a space blanket, which would also work. He cooks, so he must have some kind of pots or pans, but they won’t be very large. I’ll also have to consider what Zeke has in his gear, which at the moment is a roughly two hundred pound duffel of everything he takes when he moves to a new post. I needed to find a way to knock Slade out of the universe without giving the reader the feeling I was repeating myself. It had not yet come to me, but then, I also had to move Derek forward to a place where he could be killed, and it wasn’t going to be on this mission. The plan on the desert world is to bring them to a medieval Arabian city (somewhat sketched in my mind), to have Slade and Shella join Kondor and Zeke en route, and have Derek arrive just as they are approaching the walls. So I had at least a little time for Slade while I finished with Derek and figured out how he verses, but I needed to be thinking in that direction. I had a lot of problems with the Slade Manor idea, not the least of which was that he had a small chest of treasure and would have to expend quite a bit of it to buy the kind of mansion he wanted, even close to enemy territory, and my time to tell this story was getting shorter so I was going to have to pull him out. So he would have parted with a lot of treasure and gotten very little in return for it, and I couldn’t justify doing that to him. This dialogue was written over several days, as I couldn’t figure out where Slade was going. I had thought of the part about how in the midst of a war they rarely were in any danger of being killed, but before I wrote it I played a game of solitaire and thought of the card relationship part, so I inserted that first and then turned to the surviving a war part. I put a lot of thought into whether Colonel Simpkins was part of the plot, but two things deterred me. One was that it seemed unlikely that he would be included; the other was that it would mean Derek was going to die too soon, unless I could stretch this significantly. I still am wondering whether someone should come tell him he is free to go, and then shoot him as “killed while trying to escape”, but again it will be too soon for him to arrive in the next world. I started wondering while writing this whether to create a world for one of the characters based on the Clue® game, but then was faced with trademark issues, and wondering whether I could get around them with name changes. I would replace one of them (either Green or White, depending on for which I could find a better replacement) with Grey, possibly replace Colonel Mustard with Captain Musgrave, maybe use Miss Lavender and Miss Rose, Professor Plumb, and the deceased host might be Mr. Soma or some other foreign name. At this point I need Kondor to survive in the desert credibly; I need the reader to feel that he is doing things that are not merely striking in a random direction in the hope of finding civilization. The use of a stick to determine which way is east by the shadow created by the path of the sun, and the solar water collector, probably both came out of a 1960s edition of the Boy Scout Fieldbook (not to be confused with the Handbook); I have never used either nor heard of anyone who did, but then, they are techniques for survival situations. The shadow to determine latitude was my own thought, although I recognize that it is mostly about the curvature of the surface of the planet and significantly affected by the seasonal shift of the tilt. It was at this point that I figured out how to get Slade out of the present world, and to give myself a few chapters to accomplish it so Kondor could do a bit more of his desert survival and I could start maneuvering Derek to a departure point (which I had not yet solved). I had originally thought this would be two chapters, one which ended with Derek suspicious that the release might be a set-up and the other in which the Colonel came to him. However, the first would have been too short, and once it ran the second part made no sense unless the first was a set-up. It’s a few chapters too soon to take Derek out of this world, and I have not yet determined how I’m going to do it. I also toyed with the idea of Derek being thanked by the Ambassador, but I realized that the situation is entirely too awkward in too many ways, and I didn’t see a way to make it work. I lost part of this chapter. I had started writing it during a storm, so I did a quick save at one point, and then I wrote more. I had other things I should have been doing, and my time was slipping past, so I decided I would leave it and return–but when I closed the document I accidentally hit the “no” when it asked to save it, and didn’t have time to go back and try to remember what I had written. I’m still not sure whether I had anything good that I lost. One of the actresses who played a companion on Dr. Who once commented that there were only so many ways you could say, “What is it, Doctor?” but that this was the essence of your part: companions exist so the Doctor can explain to someone what is happening so the audience knows. We don’t have that problem with books, because at least for the primary characters internal perspective permits us to convey what the character is thinking and feeling, but as I started to integrate Zeke into Kondor’s life I started to feel like his role was becoming something like a Whovian companion. I added the line about electrolytes and water soluble vitamins maybe an hour after I wrote that paragraph, when I returned to work on it more. It seemed to me that it made him sound more like the doctor he is. The cheese and crackers might owe something to Gumper’s Four-man Meal Packs®. One of the lunches contains Velveeta® with some kind of cracker, although I’m only guessing that it’s saltines. I remember that another contained Spam®, all of them contained a powdered spread that became something like jelly when mixed with water, and there was some kind of cracker which in at least one collection was Melba Toast®. They had the virtue that in their sealed plastic bags they kept well over long trips even if the canoe swamped. I talked this through with Evan, because I knew exactly what was going to happen but not how to convey the story to the reader. I had arranged for Slade to flash his chest of wealth at the mess tent, and figured more than one soldier would have seen it. One, or maybe two, would believe that that was enough wealth to set them up for life, and then some–but they would not be so foolish as to suppose they could take Slade alone. Thus they have the problem of deciding how many people they should trust to help them–more people increases the chance of success but decreases the size of the share. Then they have to follow Slade and Shella out of the camp and ambush them. The problem is that my perspective rules forbid me from giving the reader anything not known to the viewpoint character–in this case, Slade. If it went to plan, five or six men would get around Slade and shoot him with flintlock rifles. They would not expect trouble from Shella–she’s a woman, after all. If they kill him by surprise, he is out of there–but the reader never knows what happened, and I’m trying to avoid the impression that it was a random death in war, so I have to let the reader know what is happening somehow. That means a confrontation, so someone will explain something. Obviously the ambushers are not going to initiate a confrontation; their plan depends on surprise. That means Slade has to confront them. However, six ordinary soldiers armed with flintlock rifles–Slade and Shella have defeated considerably more potent enemies, and indeed Slade has taken out worse than that himself, even before he faced the snake (trained armored prison guards with kinetic blasters). Once he knows they are there, it is difficult to make his death credible, particularly if he has Shella assisting. I kept wanting to have Slade throw the dagger, but knew that that would leave him a weapon short, so I saved it for a moment when in doing so he would be able to take the weapon from the person he killed. I think the fight works, as Slade gets weakened a bit at a time and ultimately kills or injures all five of his attackers before falling. Getting Derek back to London would be quick and easy, and there would be a brief debriefing which I didn’t have to cover. Then to get the timing right I was going to have to launch him on another mission quickly, which meant finding something different, and then kill him in the early stages. What that is I don’t yet know. The Why Spy game scenario recommends that referees take popular spy movies, begin with the set-up, and bring the character into it at a likely starting point. The problem for me is coming up with a scenario that won’t be obviously plagiarized. On the other hand, if I can find one that is dangerous enough up front I can finish it before it has moved far enough to be recognized. I again marked the arrival of Bob Slade in the story of another verser, partly because I didn’t want Kondor to be surprised at his arrival but at the same time I didn’t want any confusion over why he wasn’t moving to meet whoever it was. I spent a few days trying to devise a new mission for Derek. My parameters were problematic. I wanted it to be something that made sense for him, but had a good chance of getting him killed. The idea that Samantha would vanish looking for Dorin was not as obvious to me as it seems in the text. I then balked at the American name. When I give passports to player characters in this scenario, we always establish the names on them up front so that we have them, but when I did it in the book it was not at the time important. I had tossed around a number of names in my head–John Smith, Jim Bond, Pete something–and then thought of making him John Quincy Adams, after the fourth President of the United States. I dropped the unusual Quincy (although for a moment I considered making it Quentin to preserve the middle initial) in favor of the more common David, partly so I could make the joke about how it didn’t sound like an American name to C, who of course would think it sounded like a common British name. I also wanted to send him in as not who he was but as someone else, and that would only work if I connected him to a different embassy. The American embassy had advantages that he would have no trouble with the accent and I could involve the Reptile House, both because they would know him on sight (helping confirm his identity) and because they’re a good team that I rarely have used so maybe I could put them into action. I had long been thinking about the fact that if the soldiers killed Slade his treasure would go with him, and realized that he would find that quite funny. I realized that the flintlock rifle would go with Slade; it was in my head several times. This seems more like a piece of junk that encumbers him, but I’m not yet sure that Shella won’t find a use for it. This was an obviously great idea from the perspective that it made sense for it to happen and for Derek to be sent into it. The down side was that that was pretty much all I had–Ambassador’s daughter left to look for her lost boyfriend who was really a spy, and did not return. Further, I have to move it forward quickly enough to get Derek to a dangerous spot soon, but I’m not sure how. I do have the advantage that with so many independent teams working on it at once, Derek could easily get a call that says she’s been found and then respond with the team to the location, cutting out a lot of the bothersome searching part. At this point I have Slade and Kondor in the same world, and although they don’t know it the reader undoubtedly does. That lets me return to the system by which I alternate Derek against both of them, moving his story forward more quickly than theirs. The oscillating movement is something I worked out by thinking it through while writing it. I also needed to make it seem as if it took Slade and Shella a while to reach Kondor, so this is sort of a waiting chapter to create that sense of waiting. I had forgotten when I wrote this that it was supposed to be lunch. At first I thought no, it’s just a meeting, and the statement that he was having lunch with the Ambassador was the cover for the meeting. Then I decided that the cover worked better if food was actually served, and Derek had just flown in from London (several hours, if memory serves) and would be hungry and thirsty. Coming up with American food was easy. Most of Derek’s ideas come from television shows I’ve watched, but I tried to sort them into the obvious ones and the less obvious ones. It quite honestly had taken me so long to write this that I did not recall what kinds of “bugs” Derek had planted on Samantha, but I needed for there to be a way to get an image of Dorin so I decided I would make sure on the rewrite there was a camera and a GPS tracker in addition to an audio bug. I knew that Shella was going to use magic to provide food and shelter. The connection to having learned the spells from Bethany was fairly obvious once I thought about it. The discussion of appropriate courtesy was something I stumbled into. This has been the sixth behind the writings look at Spy Verses. If there is interest and continued support from readers we will continue to publish this novel and the behind the writings posts, and prepare the fifth novel to follow it. This is mark Joseph “young” blog entry #264, on the subject of How About Danny Taylor. Many of you are asking, how about whom? When I mentioned, though, that Andraé Crouch was not the only artist recording an album during that concert at Carnegie Hall, well, Danny Taylor was the other. He had already released one album, Taylor Made. Danny Taylor and his band, Taylor Made Music, with fellow musicians Doug Mathieu and Dona Whittemore, return to the Phillips Area Community Center. They offer a lively medley of classic country and rock. Living in northern New Jersey we thought of Danny as a local boy. Word was he lived somewhere nearby. I only recently learned that he had stayed at the Love Inn in Freeville, New York (previously mentioned in connection with Ted Sandquist). The quality of that first album was not great, even by the 1972 standards. 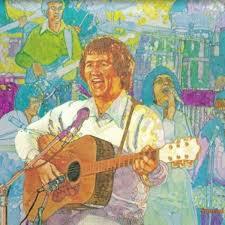 However, Jesus People bought it because there weren’t that many Christian albums out there. The songs on it were all right, but the only one anyone ever mentioned was the penultimate track, How About You. Jeff Zurheide and I covered it, and we did not cover many songs. I’m not sure what the appeal was–maybe it was the somewhat goofy opening line, “Railroad tracks are tied, how about you?” which was delivered in complete seriousness. A colleague, a fellow college-aged musician running his own band in Bergen County, once wrote to Taylor and sent him a tape. He got a polite reply, eventually, saying that he had to work on his lyrics. I remember that a lot of Nick Berezanski’s lyrics (I’m not going to swear to the spelling of his name, but I will say that his band was named The Tetragrammaton Life Saving Bank with the Dust of the Earth and I Don’t Know When He’s Coming So Be Ready) were rather clever, but his guitarist admitted that Nick sometimes had trouble with them. That, though, is kind of off-topic here. At the radio station we had a copy of his other live album, I’m Not a One-man Show, recorded with a band in Kansas City and having much better production values across the board. He released a few other albums, but I never heard any of them. I’ve seen a couple of discographies of him online, both incomplete, and am unable to find a track list for either live album. However, I clearly remember the novelty song from the later album, Snatchin’ All the Children. In fact, twice I played at a local coffeehouse, and one of the other artists playing there the same night performed the song. We got to talking, and he said that he’d been part of Taylor’s band for a while at one point. I wasn’t certain whether I should be impressed–it’s that local boy thing, that I didn’t ever really think of Taylor as one of the top musicians in contemporary Christian music even though he was really rather good and one of the earliest. He died in Nashville in 2010; his obituary mentions more about him, including that he toured with Randy Matthews and Mike Johnson for a while. This is mark Joseph “young” blog entry #263, on the subject of The Ten Book Cover Challenge. As mentioned, Jeni Heneghan tagged me in a ten-bookcover challenge on Facebook. 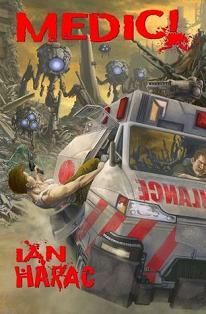 I’m starting my list–and I know I’m not really supposeed to say anything about the books, but that seems a bit pointless to me–with one of the books I most enjoyed in recent years, Ian Harac’s Medic. I had previously read his The Rainbow Connection, and enjoyed that thoroughly, but I think he topped that with this one. I am also tagging Ian Harac to take up the challenge. The deal is for ten days post the cover of a book you “love” (take that however you wish) and name someone to do the same. My Goodreads review is here. Interestingly, at the time I appear to have liked Rainbow Connection better, but in retrospect Medic is the one that comes to mind. It’s a busy day, but let me not forget my obligation to Jeni Heneghan, who challenged me to post ten book covers of books liked or something in ten days, and nominate ten people to the same task. 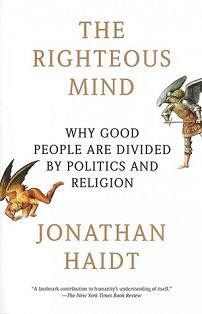 This time I’m going for something non-fiction, The Righteous Mind by Jonathan Haidt. Haidt explores six facets, what I think if memory serves he calls pillars, which are the bases of our notions of “good”, and how most people in the world use all six but modern liberals use only three, and how this results in very different views of what is right. It’s perhaps the best exploration of these ideas I have encountered. Again, my GoodReads review is here. And I almost forgot: I nominate Eric Ashley. I’ve enjoyed many of the books he sent me. Time to post a book cover (thank you Jeni Heneghan for the invitation). 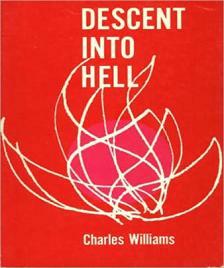 I said I would try to avoid the obvious Lewis and Tolkien titles, but this is a close friend of theirs, Charles Williams, of whose handful of wonderful books I think my favorite is still the first one I read, Descent Into Hell. I first read this in college as a course assignment in modern fantasy/sci-fi literature, and was immediately much impressed. It was probably two or three decades later that I found it again, along with a couple other of his titles (War in Heaven, Greater Trumps), and was not disappointed in the least. Williams is wonderful at blurring the line between the material and the spiritual, the natural and the supernatural. His characters interact with each other, whether alive, dead, or imaginary. This book also gave me some very challenging concepts–such as that bearing each other’s burdens was a real active thing. And because this book reminds me of someone else who read it in that course who also found it interesting, I’m going to tag Richard Van Norstrand to take up the challenge. You’re not required to do so much as I do, just over the course of ten days post the covers of ten books you “love” in whatever sense, and invite someone else to do the same. This is my third. For what it’s worth, I’m also building a web log post from these, so once the ten have run you can expect a complete summary, largely because I hate these multiple-first-post threads when I want to know what the other posts were. Back in the early 1970s when I was at Luther College the library had one of those books sales, clearing out old copies. I wound up standing beside the Dean, Dr. Harm, as he examined a book clearly older than I was, and commented that it was once the classic book in apologetics. For twenty-five cents, I figured I could afford it. 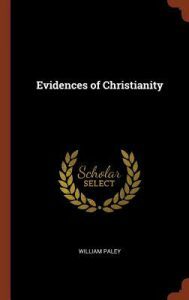 I’m about 98% certain that the cover and title page gave the name as Evidences of the Christian Religion by William Paley. I don’t find that title on Goodreads, which apparently finds no editions more than ten years old and calls it by various names of which Evidences of Christianity is the nearest to the original. I don’t have a review of it posted anywhere. In fact, it was a ponderous read for a college sophomore, and when I was about three-quarters finished the aforementioned Richard Van Norstrand borrowed it and took it home, only to have his father borrow it from him, and I never saw it again. Still, I got through the bulk of it. This was the book in which Paley presents the teleological argument for the existence of God in its most famous form, the watch argument, that if you find a watch you deduce that there must be a watchmaker, and since the universe runs like a watch, there must be a universe maker. I was impressed by the meticulous way in which Paley presented his argument–no leaps, no skipped steps, no assumptions that the reader will see how to get from A to D without having been told what B and C are. Part of that no doubt is that writing in the nineteenth century (and I’ve read several other nineteenth and early twentieth century books) he did not have to compete with more concise forms of entertainment–readers expected books to be long, because otherwise they didn’t get their money’s worth. Yet it was instructive, in that many writers, and perhaps including me, tend to make such leaps and assume the reader understands the intervening reasoning. I keep swithering concerning who to tag next, but I think I’ll go with Nikolaj Bourguignon. Odds are he’ll post a lot of books I can’t read (the word for someone who speaks several languages is multilingual, while one who speaks two languages is called bilingual, and one who speaks only one language is called American, and that’s pretty much me–I took French in high school, but can’t even read the French translations of my own articles at the French edition of Places to Go, People to Be). Still, I know he’s a reader with broad interests, and that will make it interesting. Almost forgot the book cover on this overladen day, but I’d already selected the book, Fahrenheit 451 by Ray Bradbury. I read the book in high school as part of an English course in science fiction literature, and having more recently re-read it cited it as recently as a couple years ago. In short, this book is everything a great science fiction classic should be. It tells a compelling story in a futuristic world while making a significant point about contemporary issues. 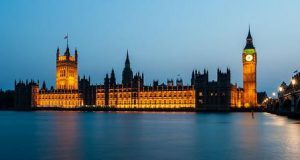 The primary issue here is censorship, government control of information, and while government control of information doesn’t seem like a significant concern our articles in recent years on freedom of speech might suggest otherwise. I’m going to invite Rick Maus to play next, because he was in that class and as I mentioned somewhere else in my writing was a member of that Great Meditators Society decades ago (he probably doesn’t even remember it), and it might be interesting to see what books he’s been reading. The invite is to post ten book covers in ten days (it does not require saying anything about them other than implicitly that these are books you in some sense “love”–that part is just my inability to keep silent) and nominate ten people along the way to do the same. I’m also adding a tag to the current location of the Freedom of Expression series in which Bradbury is mentioned. Again with acknowledgement that Jeni Heneghan invited me to participate in this, let’s do the next book cover. 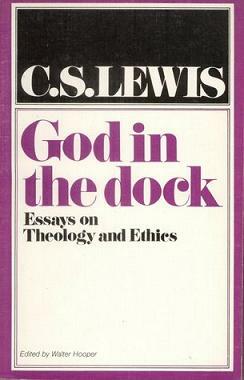 I know I promised not to clutter the list with C. S. Lewis–undoubtedly my favorite author, and I could name easily a dozen from A Horse and His Boy to Perelandra to Mere Christianity to The Great Divorce, but I’m going to go with God in the Dock. The book is a collection of essays and letters previously published in many sources covering a wide variety of subjects, and arguing them intelligently. You might not always agree with Lewis, but if you haven’t read his arguments you can’t really effectively defend your own positions. I’ve been meaning to tag Edward Jones to invite him to play. The game is, post ten covers over ten days of books you “love” in whatever sense you want to take that; it is not required that you say anything about them (I just do, because, well, you know me, I have to talk about stuff). You are also supposed to invite someone else to do the same each day. No obligation, of course, but I’m interested in what books you would pick. For today’s book cover I’m stretching the meaning of the word “love” a bit. By stretching a bit, I mean I hate this book, and I hated it when I read it–but I think it’s an important read, partly for many of its ideas, and partly because people think it says things it doesn’t. 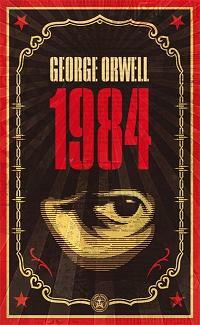 The book is 1984 by George Orwell. I read his Animal Farm in high school, and found it interesting and entertaining, so when I saw this book I decided it might be more of the same. Boy, was I mistaken. It is a bleak story with a horrible ending. Yet it is compelling, and the world it paints is filled with concepts that are important for us to grasp–notions like doublespeak, when the words you say don’t mean what the words mean. However, people often think that Orwell predicted the world in which we presently live. His vision is completely wrong on the critical points. In the world he presents, the ruling powers control all information, rewriting the records whenever they want history to be different from what it was, and it is impossible to find anything other than the party line. In our world, the problem is reversed–we have an information explosion, and you can find everything, every position, every opinion, expressed on the Internet, with no one in control, to the point that it is often difficult to know what information is true. No one controls it. So Orwell was wrong. He still tells a compelling story, and no one should cite this book who has not read it, because it doesn’t say what many people claim it says. I’m going to tag Donald Chroniger next: you are invited to post ten book covers of books you “love” (however you interpret that) over the next ten days, and invite one person each day to do the same. You are not required to say anything about the book beyond identifying it. This is number eight in the book cover challenge Jeni Heneghan invited me to tackle. 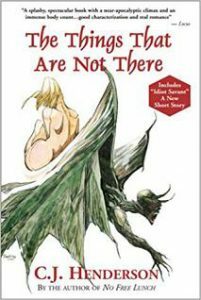 I’ve gone with a book by a recently deceased friend, C. J. Henderson, my favorite of his books and the first in the Teddy London series, The Things That Are Not There. C. J. wrote a lot of Cthulu Mythos stuff, with the blessing of the Lovecraft family, and although the monster here is called Ctala it’s the same kind of being. Rather than coming from outer space, C. J.’s unimaginable creatures come from parallel dimensions, more credible in the modern age. The other significant difference, as he shared in our chats at Ubercon, was that whenever his characters faced these incomprehensible evil beings, he found he could not stop them from fighting back. London in this book is hired by a girl who thinks she is being followed by something–and then the something falls through the window, and he and the office maintenance man struggle to kill it and take it to a doctor to attempt in vain to identify it. From that point forward they discover that they are on the front line to prevent the opening of a bridge from another dimension whose chief denizen wants to devour all of humanity. It is a tense and exciting book throughout, and I’ve read it twice and will probably read it again one day. I’ve read the rest of the series, and although most of them are good, this is far and away the best. I’m going to tag Harry Lambrianou, because he’s commented on a couple of these book postings so I know he’s following the series and will know what to do. Oddly, I have no idea what book I’m going to post tomorrow, or who I’m going to tag, so it will be a surprise for all of us. I decided on today’s book. 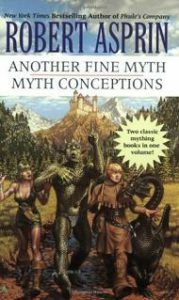 The copy I happen to have is actually two books in one cover, but although I’ve read the first ten or so of the series and enjoyed them all, the first book is the one I’m tagging: Robert Lynn Asprin’s Another Fine Myth. It comes alone or in this two-book set, or in a five-book volume (I think). It’s a playful bit of fantasy that tells a good story while at the same time being very tongue-in-cheek about fantasy tropes. My Goodreads review of it is here. Looking for someone to tag, I stumble upon Dave Mattingly, who was himself a publisher for a while and even put one of my books in print, so we’ll give him the chance to pick ten covers of books he in some sense “loves”, and name ten people to do the same. 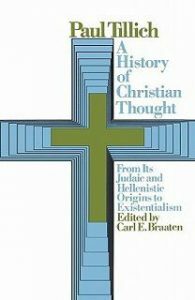 I long debated what the final book on this list of ten should be, and settled on Paul Tillich, A History of Christian Thought: From Its Judaic and Hellenistic Origins to Existentialism. 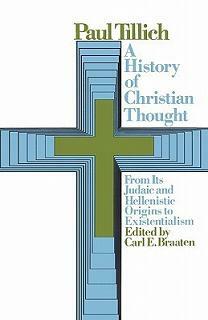 It’s certainly not “light reading” by any stretch of the imagination, but it is an excellent source either as a text or a reference for the development of western theology and philosophy from the second century through the Enlightenment. It gets a bit weak after that, but still covers many of the important names. My Goodreads review is here. I’ve got a couple of honorable mentions to post. First, let me apologize to my (first) cousin (once removed) T. M. Becker (Writer of Young Adult Fantasy). 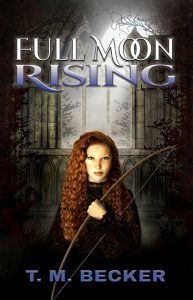 Her novel Full Moon Rising was truly excellent, as my web log post #223: In re: Full Moon Rising asserts. Honestly, the choice tipped on the fact that I had already posted six fiction titles and only three non-fiction, and I thought that if I couldn’t balance them at least I should get closer. 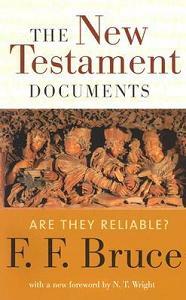 Also on the “almost made it” list is F. F. Bruce, The New Testament Documents: Are They Reliable, a classic which more people should read which also has the virtue of being relatively short. I chose otherwise mostly because this one is a rather limited subject–an extremely important one which he handles extremely well, but still not as valuable as a reference. I need to tag one more person, so I’m going to choose Tsiphuneah Becker, to see what sort of books she likes. In case you’ve not been following, you are invited, without obligation, to post covers of ten books, one a day, over the next ten days. They should be books you in some sense “love”, and you are not obligated to say anything about them. You also are asked to post, again one per day, names of ten people to undertake the same challenge. So that’s the conclusion of the ten-bookcover challenge. I hope you found an interesting book in that batch.